Viewing topic "Sonar 8.5 Producer & XF6 ?" I am new to the forum and I know just enough to be dangerous. I don’t even know if im posting this in the proper place? If I did’nt please let me know and I will repost it. I write and try to produce I’m diving in deeper trying to get a better understanding. I’m not completely ignorant I’d say I’m at 35-40 % as far as knowledge goes. I have tons of soft synths and vst’s plug in’s rtas etc etc and i know how to use them. I have been using a Axiom 49 to trigger them but it looks like the xf will do it all if set up properly. Ive been reading all the different post about sonar and the Yamaha xf series. I have Sonar 8.5 producer. I have been able to record with the XF using midi ins and out cables buy Ive read its better to use the usb cable. When i pull the song back up in Sonar it looses the patches I used to record with? 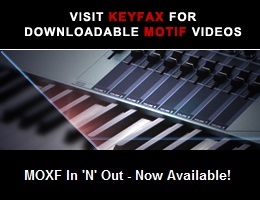 So my question is whats the easiest way to configure my daw with the Motif XF6 to get the most out of it? Check the answer in your other post. It’s best to no post the same question in multiple places.